Lock in a great price for Hacienda Del Sol B&B – rated 9.5 by recent guests! Great Mountain View’s from our room. Delicious breakfast, friendly staff. This place was so lovely. Everything about it was well thought out and fantastic. The staff couldn't have been more accommodating and their service and attitude were excellent. Can't wait to go back for a longer time! The B&B is beautiful and in a beautiful setting. Everyone there went out of their way to make us feel comfortable. We are vegan and they even made us vegan breakfasts! The robes were a lovely touch. You don't usually find those unless you are staying at a 4 or 5 star hotel. We loved this place and highly recommend it!! Beautiful property, great staff, a special place to stay! Great room, beautiful outdoor area, nice breakfast and friendly hosts. Everything!! Staff way truly wonderful, warm, and helpful in every way possible. View was amazing. We were more than pleased with everything at Hacinda del Sol....loved the lovely courtyard, the fireplace and CD player in our room, the wonderful breakfasts and most of all, our gracious hosts. Unfortunately, we had a car issue on Labor Day weekend which required an additional day's stay. They did absolutely everthing possible to accomodiate our needs for another night, to help us find a local repair service, and to make the entire issue as easy as possible. 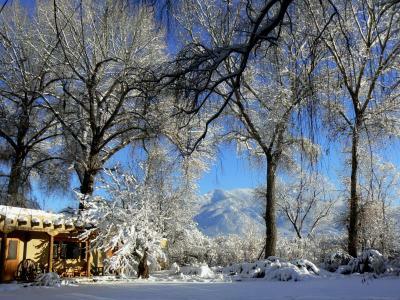 We will never stay anywhere else when visiting Taos! Looking out on the garden, listening to the birds. Breakfasts were incredible. Brian and Stephanie we're the innkeepers and we're delightful. We really enjoyed our stay. 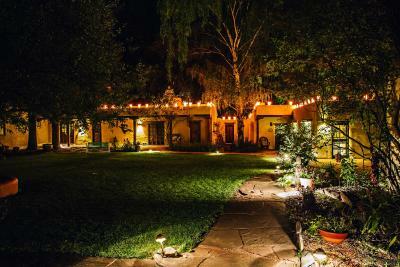 Hacienda Del Sol B&B This rating is a reflection of how the property compares to the industry standard when it comes to price, facilities and services available. It's based on a self-evaluation by the property. Use this rating to help choose your stay! 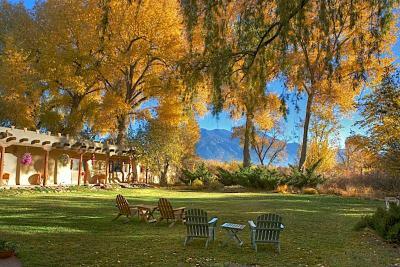 This Taos bed and breakfast is less than 15 minutes’ walk from the Historic District of Taos and features south-west kiva fireplaces in most of their rooms. An outdoor hot tub and gourmet breakfast is also offered. 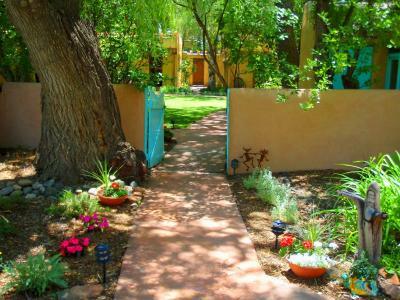 Guests can enjoy views of the Taos Mountains from Hacienda Del Sol’s garden courtyard. The bed and breakfast features a library and free WiFi. 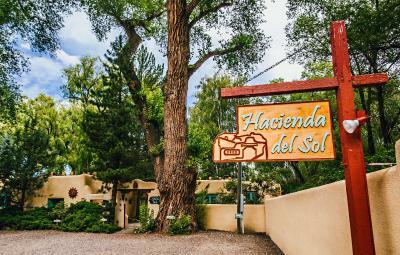 Hacienda del Sol is 15 minutes' drive from the Rio Grands Gorge, 2 miles from the Taos Pueblo area, and 25 minutes’ drive from Taos Ski Valley. 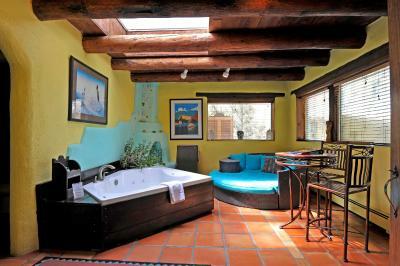 When would you like to stay at Hacienda Del Sol B&B? This room, featuring southwest decor, comes with a fireplace and sitting area. A small fridge is also included. This suite features a tile/marble floor, private entrance and seating area. This double room features a fireplace, private entrance and CD player. House Rules Hacienda Del Sol B&B takes special requests – add in the next step! Hacienda Del Sol B&amp;B accepts these cards and reserves the right to temporarily hold an amount prior to arrival. Hacienda Del Sol B&B accepts these cards and reserves the right to temporarily hold an amount prior to arrival. Location and character were both excellent. The manager was very nice and helpful and the setting was so beautiful I took a number of photos of it. What I didn't like was having to leave. We had several days left on our trip, but Hurricane Florence was on her way and we had to get home.